We had a great time at NetSuite’s SuiteWorld user conference the other week in San Jose. Just look at these happy faces! We heard a lot of great things while we were at the conference including exciting product and visionary keynotes from NetSuite leaders about where technology is going and how the cloud is enabling faster, easier, more user-friendly technology. One of my favorite quotes from the conference came from the CEO at QlikView, Lars Björk, who said “If it isn’t simple to use, it simply won’t get used.” This is definitely a sentiment with which we at Luxent couldn’t agree with more: you cannot underestimate the power of simple technology and the impact it has on everyone from your company’s users to your end customers. It’s hard sometimes to balance the message of being simple, particularly when it comes to technology. For a lot of us, we have to walk a fine line between being sophisticated, robust, do-it-all, do-it-better while also ensuring a product is easy enough to use to become an accepted part of the business flow. It can be tricky. But, as Lars so eloquently put it, if it’s hard or cumbersome to use, it won’t be. Or, in light of another option, it won’t be used effectively. Take quoting for example, an essential part of the sales cycle. Everybody has to provide quotes to customers, so there isn’t any other option but to get it done. For many, the process is difficult, manual, and inefficient. When we built a quoting solution, iQ CPQ, it had to not only make the entire process faster and more accurate, it had to be simple for the user so that he or she could create, approve, and send a quote without the usual tedium of going back and forth between systems and approvers. Beyond the application itself however, is the next crucial part of creating truly usable, simple technology: how it interacts with other systems. 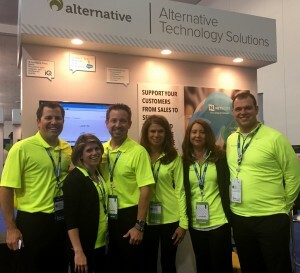 Most systems, particularly large systems like NetSuite and Salesforce, can be improved by point solutions that seamlessly integrate with a core platform to bring in additional functionality and expertise (that’s why NetSuite and Salesforce, as flexible cloud-built platforms, have robust AppExchange environments where complementary solutions can be discovered). For solution developers like Luxent, this is an extremely important part of delivering simple technology. To go back to Lars’ quote, if it’s not simple it will not get used–this is where it becomes paramount that solutions are thoughtfully built, integrated, and leveraged so that users can benefit from simple technology. All in all, the term ‘simple technology’ is somewhat of a misnomer. In actuality, a lot of thought and planning and partnerships have to go into ensuring technology applications and platforms can work well together so that the promise of simple technology can be achieved and effectively used. When done well, the proof is in the output. If you’d like to learn more about iQ CPQ for NetSuite, join us on our June 24 webinar. Registration is available here.